The "Lesotho Promise", the largest diamond found this century, has gone on sale in the Belgian city of Antwerp. The white diamond was unearthed on 22 August at the Letseng Diamond Mine in the southern African kingdom. The 603-carat gem is the 15th largest ever discovered. "It's about a third bigger than a golf ball," a spokeswoman for the owners said. The Letseng mine is jointly owned by the Gem Diamond Mining Company of Africa and the Lesotho government. "The stone is an exceptional colour, rated D, the top colour for diamonds," they said in a statement. The value of the gem, which in its current rough form weighs 120 grammes (4.2oz), depends on how many cut diamonds can be crafted from it. Diamond cutters from around the world have been examining it, and the winning bid will be announced next week. The "Lesotho Promise" is the biggest uncut diamond discovered since the Millennium Star, at 777 carats, was found in the Democratic Republic of Congo in 1993. 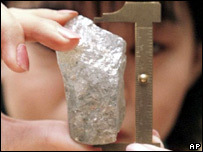 But the largest diamond ever recorded is the Cullinan, found in 1905 in South Africa, which weighted in at 3,106 carats. The 530-carat Star of Africa was cut from it and now forms part of the British crown jewels displayed in the Tower of London.